There’s always something that’s “in” for the moment. Maybe you experienced mini-skirts in the ’60s, polyester leisure suits in the ‘70s and shoulder pads in the ’80s. If so, you may just be interested in the newest “in” thing — lasering away the signs of aging. Lasers certainly aren’t new, but they have dramatically changed. No longer do all laser treatments leave you burned and sore for weeks or cause excessive pain. You don’t have to do extreme peels that mean days off from work just to get a fresh look. Recently a couple of Rockwood Clinic doctors bought the cutting edge in lasers — allowing you to get rid of a spider veins, age spots or fine lines without cutting or peeling. “It’s where it’s at,” says plastic surgeon Dr. Kaiulani Morimoto referring to laser treatments. At her office they use the Cynosure laser. It’s different from many lasers because it can actually treat two problems within one treatment. The laser has two components that shoot five varying wavelengths. If you want to target a spider vein and pigment changes (you know — age spots) you can, without having two separate treatments. While older model lasers may have produced great results, it often meant weeks of recovery. Now, Dr. Morimoto said most of her clients can choose to do a treatment at the end of the day and be ready for work the next morning. Some people are certainly more sensitive, but overall the treatment is less invasive than with lasers of the past. “I thought, ‘Oh gosh, when did those end up here?’” says laser patient Betty Simpson, 51, as she jokingly referred to her laugh lines (which don’t make her laugh). Simpson had a laser treatment that took only minutes and left her with soft skin. She deemed it painless. “I liked it,” she says. To achieve the look she wants it will take a few more visits, but Simpson left the doctors’ office with no visible signs of trauma. 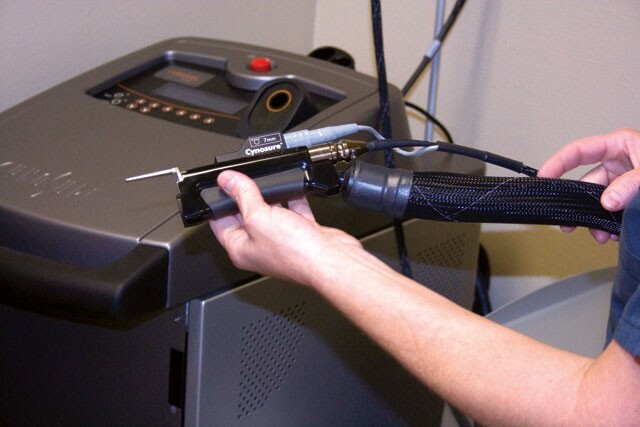 As with all procedures, the laser therapy can have varying results, and there may be complications and extra costs. Getting rid of simple spider veins may only take one treatment, while getting tighter skin or reducing discoloration can take some patients up to four visits. That can add up. At the Rockwood Plastic Surgery Center, a spider vein treatment costs about $250, while a complete skin retightening is closer to $2,500. It’s also important to note that nothing lasts forever. But if you’re willing to take care of your health, laser therapy may be just the thing to help you tiptoe back a few years in time.